Ever since I collected seed of a begonia in a Nepal forest back in 1990 I've kept plants growing from the original seedling by cuttings. It was identified as Begonia hatacoa and has the suffix PGG 209 to record its wild origin. I very nearly lost it a couple of years ago when my last plant died, but fortunately my brother-in-law still had a plant which I'd given him years before. Another cutting later and I was back in business. 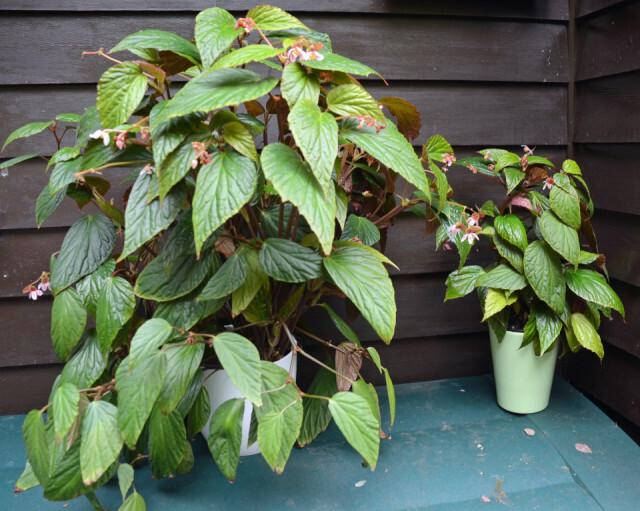 I've Blipped this begonia, or one of them, several times already, and over the last year have given plants to several friends and fellow gardeners because as we all know, if you want to keep a plant you give it away! Last week my fellow Blipper weeflecky asked if would babysit her plant for a couple of weeks while she was away, so I've used the opportunity to photograph mother and child together!